Using a yarn needle and blue yarn whip stitch the field of blue onto the stripes in the left corner. Next, sew on a pin back. 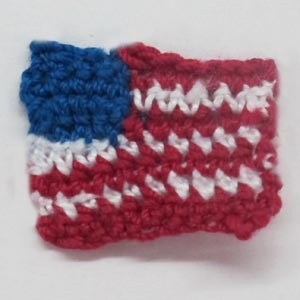 This entry was posted on Saturday, June 30th, 2012 at 10:24 AM by Emilee Gettle	and is filed under Free Crochet Patterns. You can follow any responses to this entry through the RSS 2.0 feed. You can skip to the end and leave a response. Pinging is currently not allowed. Regarding your flag-pin: I would also add a few small “stars” to the blue area by cross-stitching the small stars onto the field of blue (putting a plus + sign and an X together) and finishing off with a small knot at the back, either for each or separately. If you are using a safety pin and gluing or sewing it to the rear, the knots will not be seen in the front by eyes that are looking for them. These would also make good patriotic symbols for a political rally or returning servicemen/women.